Often users will be shocked to find video is being stored only for as half as long as they expected. The #1 problem is typically unoptimized motion based recording. Various real world problems will cause unoptimized systems to record fare more often that they should. In this note, we examine the 6 most common problems and how they can be overcome by optimizing motion recording settings. Landscaping: A winter tree with no leaves may not have enough movement to trigger motion but after it grows leaves it may become a big source of motion noise. Be aware of how seasonal landscape changes can affect what is being recorded. Keeping landscaping manicured can go a long way to minimizing this issue, but sometimes 'hard' masking of moving areas are required to offset these impacts. Banners, Signage, and Decorations: Items suspended from ceilings move around when air handlers are working. Subtle drifting of a banner make be just enough pixel change to keep a camera recording. Seasonally changed decorations are another common source of false positive movements. Even worse, these items are relocated or changed frequently. Often, these changes are so significant to a scene, the only adjustment is a reconfiguring motion sensitivity in the entire FoV. Screensavers: Computer, television, or digital signage continously update images and can trigger inadvertant recording, especially in darkened rooms. Consider adjusting motion sensitivity at night or masking out the screens of monitors or signs. Glare, reflections, and headlights: Intermittent exposures of light are very frustrating and very difficult to adjust for due to the randomness involved. Ice, snow, and pools of standing water often cast reflections in hard-to-predict places. Consider adding light shades, or masking windows to reduce the impact of these events. Take note of this situation during site survey and consider beefing up storage estimates for cameras located in these areas. Flashing lights: A lightsource with a steady blink is frustrating but easy to adjust for, especially since these light don't move. This problem is commonly found when motion detectors, traffic lights, or highrise tower lights are part of a recorded scene. Since the location of these lights are fixed, they can be masked out. Digital Noise: The camera itself can cause false motion recording. Many cameras generate visible 'digital noise' in darkened environments, where the imager 'picks up' static and interference from the camera itself, and records nothing outwardly noticeable. This frustrating condition can be corrected by adjusting the minimium motion threshold levels to screen detection of digital noise. If you have the money and room for more hard drives, adding in more storage is one way to address the problem. However, often budgets or tight or space available for more drives in limited. The other way to overcome, without having to add any more hardware is to optimize motion detection settings. 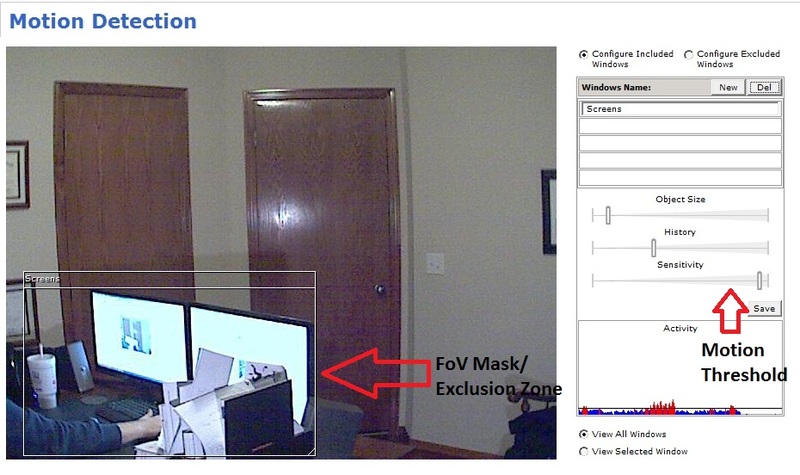 Modern systems enable outright FoV masking (exclusion) and motion threshold adjustments to reduce nuisance events from being recorded (screensavers, digital noise, etc.). The integrator should review and optimize these settings a few days after a system is installed to see what types of false motion issues are being recorded. During this time, the integrator should explain to the end user the motion threshold and motion sensitivity settings and how ambient movement in the scene affects what is recorded. The integrator should ensure the end user understands that even minor adjustments affect motion recording greatly, and that major events can be missed if adjustments are not made properly. FoV masking is used to block out a specific area of the scene that is causing problems. For instance, if a screensaver on a PC monitor is causing problems at night, mask the entire PC. Motion thresholds are used when recording is being triggered but there is no obvious object causing the issue. Typically, the problem then is digital noise that appears across the entire image. Raise the threshold level step by step to find the minimal level that eliminates the spurious recording. Finally, either the end user or integrator should periodically review recording duration. Over time, recording duration may drop. For instance, at first it might be 30 days but a few months later it could drop to 20 or 22 days. This typically indicates that changes in the scene have occured and motion settings might need to be reoptimized.